Players, meet Corroder. Corroder, players. You'll be seeing a lot of each other. Part of the (in)famous 'Anarch Breaker Suite', this is one of those cards that has not only remained strong throughout the game's life up to this point, but it's remained one of the baselines against which most traditional breakers will be measured. Like most cards in the Core Set, I failed to fully appreciate this card the first time I looked at it. I did not see the numbers (the numbers, man...such beautifully simple numbers...). No, I just went, 'Oo, it's shinkling a glass thingy! =D' And a sound resounded in my head like someone walking through a beaded curtain made of old mirrors. To this day I have not figured out what it's supposed to be shinkling, but the image and sound have both stuck. 'Hey! You there, the confused-looking one with the rulebook. You know you want to pick me, I'll be your Death Sheep/Cyberfloof anytime'. Meanwhile Corroder just sat there, saying little more than an implied 'hi' and filing its nails. Cheap on the wallet, cheap on the brain: At 2 it's the lowest cost fracter in the Core Set, meaning you are rarely in a position where you can't get it out on the table. And at 1MU it's not demanding a large chunk of your memory. Pretty high on the potent quotiant: It's got a base strength of 2, which gives you a noticable discount against weak-midrange ICE. This will almost certainly seem like a small feature detail when you start, then you'll realise it's huge. Simple and effective. In fact that's underselling it. It doesn't get much simpler than that, and rarely more effective. It's a breaker with a good base strength that is exactly as strong as you need it to be for any given situation, with no credits lost in fancy features that you may or may not need. Battering Ram by comparison feels like you spend ages trying to get the thing down, longer lining up all the ICE for maximum damage with things like Paintbrush, and only then do you see the best results. It's great when (if) you do, and it fits Shapers theme nicely, but it's undermined by Anarch's having something that is so much easier to use. And Aurora is, well...it's Aurora. Its imprecise boosting is one thing (you'll often come up just under or over what you need), but its the 2 per is the thing that really hurts. And at 1 more to install over Corroder it's hard to find a situation where it would ever be needed. Long story short, Corroder encapsulates the Core Set tradition of being one of the cards that's good in a large number situations and (perhaps more importantly) almost never bad. It's the safe choice, the reliable choice. It's the Desperado, the AstroScript Pilot Program of fracters. You include it in almost everything, because why wouldn't you? It's so simple, so effective (and not going to rotate out) that it sets the standard against which many cards after it were designed. Before I only heard the shiny shinkles as it gleefuly dissolved whatever barriers it came up against. Now, after playing with it some more, I can sometimes hear the distant voice of the Fantasy Flight team going "We made such a great thing!...Crap." 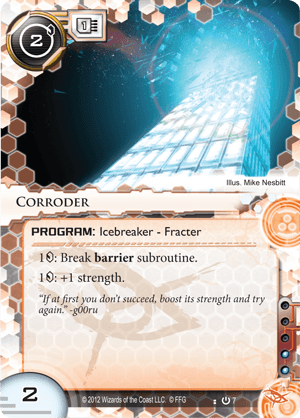 Long regarded as the best fracter in the game, Corroder does so by having the best math for breaking ice. At least, across the board in averages that is, in regards to pumpable, non counter breakers. As the game state moves on in horizontal design paths, Corroder becomes less and less as a beautiful end all of fracters. Still quite efficient, others can be more useful, especially as recursion becomes more and more prevalent and the need to get in often is replaced with understanding scoring windows and when to get in. None the less, this icebreaker was splashed into every conceivable deck for a long while, and still is found as a staple fracter, especially when dealing with the likes of Wraparound. It allows for quick early aggression due to its low cost to install, and its low cost to deal with some of the most popular early game barriers - the most likely cards to be rezed with End the Run subroutines. It is quickly falling to a weakness of mid and late game against large barriers however - Even though it is the most efficient fracter, that does not mean it is cheap. Big barriers like Curtain Wall just cost so much to get through even with cost effective breakers. Barriers are slowly coming back into the frontline now, showing how even cost effective breakers can not be the right ones. However, it remains strong even to this day, and will continue to be worth its influence cost in decks for a long time.